If you didn't know I've been into reading a whole lot so far this year because I realised I never read as much as I used to and I missed it immensely. I have a reading goal of 30 books this year so if I'm going to accomplish that I need to get a few more books under my belt, and what a perfect opportunity to do so - beach side?! Me Before You by JoJo Moyes - This one seems to be a romantic story, boy meets girl kind of thing. I'm not really that sure what exactly it's about but I prefer it that way because I don't think spoiling things for myself. I think this was recommended to me on my Good Reads account because I read quite a lot of romance/Young Adult books. The Manifesto On How to be Interesting by Holly Bourne - This was recommended by Emma Blackery; I absolutely love her videos where she talks about books. Again, I'm not too sure what this is about, but the backcover gives me the impression this is about an unpopular, 'boring' girl who starts writing. The backcover says "Bree is told she needs to stop shutting the world out and start living a life worth writing about." Submarine by Joe Dunthorne - Now this story I am familiar with as Submarine is one of my absolute favourite movies. I adore it, if that wasn't obvious from my blog. I feel like if I love something so much, I should definitely read the book adaption of it. I've heard this is a good book so if anything it'll give me more detail about the story. Trouble by Non Pratt - This is about a girl, Hannah who is fifteen and pregnant, and Aaron who is the new boy at school. He doesn't want to attract attention (taken from the blurb). I guess this could be summed up as it says on the back cover: "Growing up can be trouble but that's how you find out what really matters." Carrie Fletcher has read this book and I think she recommended it so looking forward to reading! Just a Girl Standing in Front of a Boy by Lucy-Anne Holmes - This is about 27 year old receptionist Jenny Taylor and her story of finding love. I think this one will be a feel good book about finding out what life and love is all about. Those are pretty much the type of books I read, haha. I'll also be catching up on reading my magazines as Uni has been busy. I'm so looking forward to heading away for two weeks and reading lots! 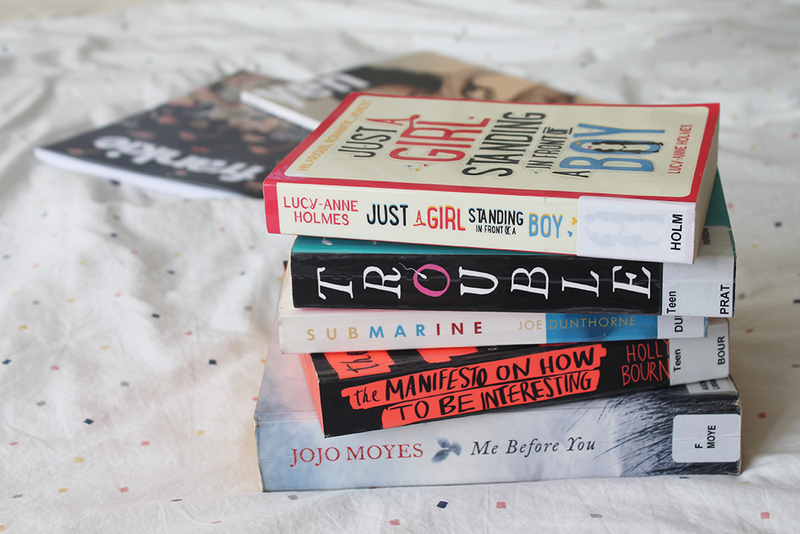 Feel free to recommend me more books to read as always! You can also follow me on Good Reads if you like.